Although we are just a day removed from the Card Player Poker Tour Main Event, which saw Fred Paradis outlast a stacked Day 2 field and Final Table to claim his fifth Foxwoods Poker title, it's never to early to start looking forward and if the next Foxwoods series isn't already marked on your calendar, get your pens out and close out your schedules from Saturday March 14th - Monday March 30th because the Foxwoods Poker Classic is going to be another can't miss series. 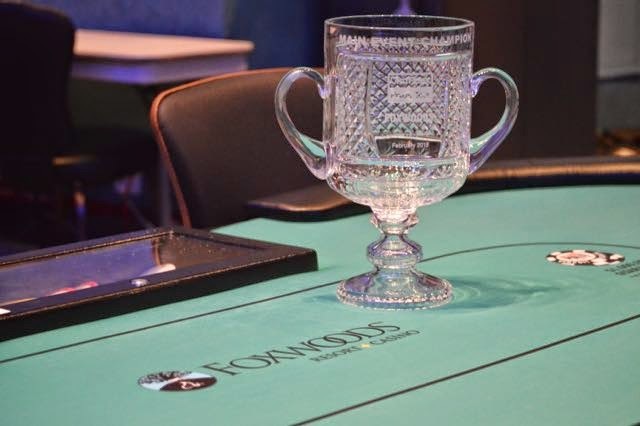 While the CPPT series had a Main Event with a $300,000 guarantee, the Foxwoods Poker Classic has two events who's guarantees will make that look like nothing as the opening Event 1 of the series and the FPC Championship will both have $500,000 guaranteed prize pools. The Championship guarantee is massive and should draw some of the best players in the area to battle for the FPC title, but the opening event has potentially the best value Foxwoods has ever offered as you can get a piece of a $500,000 GTD prize pool for a $600 buy-in. First place in that opening event should be somewhere north of $125,000 and with four starting flights for this massive event, there should be no reason to miss out on this potentially life changing tournament. In between the opening and FPC Championship events are close to two other "main events" with another $600,000 in guaranteed prize pools, including a $100,000 GTD even and a $150,000 GTD event. There are also smaller guaranteed tournaments for the "specialists" in the poker world, including Pot Limit Omaha, Omaha Hi-Low, 7 Card Stud, HOSE and many different variants of NLH including different stack sizes and level length. To find a complete list of the Foxwoods Poker Classic schedule along with structure sheets, visit the Foxwoods Poker website HERE. This is Will OC signing off from the Card Player Poker Tour, thank you to everyone who made my first Foxwoods Poker experience a great one. We hope to see you in March and wish you good luck both on and off the felt until then. For all the cashes, Final Tables and Foxwoods titles Fred Paradis has won in his poker career, he's never won or Final Tabled a championship event, but all that changed today as he outlasted a field of close to 300 players to take down the $300,000 GTD Card Player Poker Tour Main Event title. Paradis entered into yesterday's Day 2 session with a slightly above average stack and he flew under the radar for much of the day, keeping that average stack through the money bubble. He would then get moved to the "feature" table and that's when he took off, as he was the first player over the 1,000,000 chip mark and seemingly never looked back heading into Day 3 as one of the bigger stacks in the field. Day 3 played out much like Day 2, with Paradis starting slow, but staying near the top of the leaderboard even entering into three handed play as the shortest stack before taking off again all the way to his first ever Main Event title. 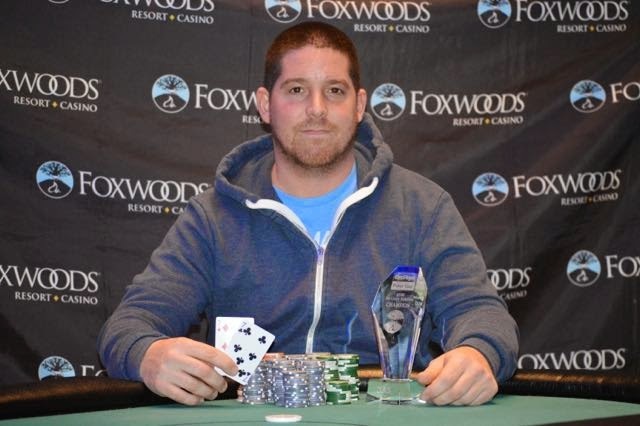 This result will earn him just over $80,000 after a chop was agreed to heads up and that score moves Paradis close to the $500,000 mark in terms of career live earnings as he claims his fifth career Foxwoods title, putting himself in rare air among the Foxwoods poker elite. That almost wraps up our coverage of the Card Player Poker Tour as we have one more event to report on, as Event 12 played down to a winner today as well. 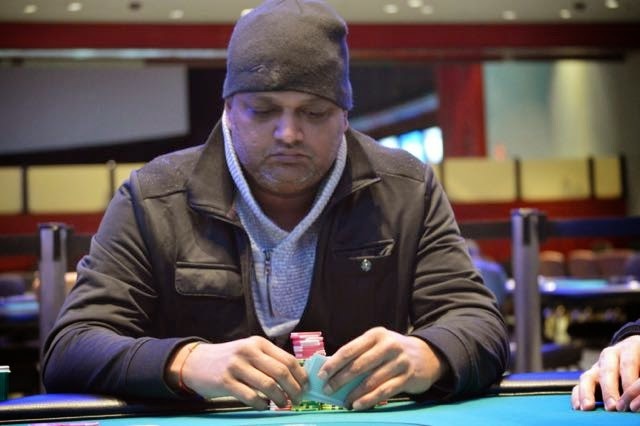 After Dilipkumar Patel doubled through Fred Paradis it looked like we were going to be in for a long heads up battle, but it was just a minor bump in the road as Paradis was unfazed by the untimely river card that doubled up his opponent as he'd get a double up of his own after losing the chip lead. The two players would get in a leveling war pre-flop and they'd pile the chips into the middle with a "classic" flip for the title as Patel held [Jh][Jd] and Paradis held [Ad][Kd]. Paradis would flop the world as he paired up his king and picked up a flush draw on the [3d][8d][Ks] board and Patel would be looking for the two black jacks to come from behind to score the knockout. They wouldn't come as the [5c] would fall on the turn and the [4d] would complete the board and the flush giving Paradis a massive double up and a commanding chip lead. Paradis would continue to chip up a few hands later as he had another monster hand pre-flop, [As][Ks] and he'd get two streets of value from Patel before forcing a fold on the river. After that hand Patel would be cut down to under 10 big blinds and would move all-in from the button and get snap called by Paradis who again held a big suited ace [As][7s]. Patel held [Ks][3c] and was more or less drawing dead on the [8s][Ac][5d] flop. The turn would brick out and Paradis would be crowned the Card Player Poker Tour Main Event Champion earning $81,528 for his victory. Patel would make an even $70,000 after the two players agreed to a chop before heads up play started. "You Can Just Call Him Mystic River"
There's a fine line between slow playing your monster hands and playing them aggressively, especially heads up, as you don't want to end the hand "too soon" as you want your opponent to get a piece of the flop to extract some value. But, you don't expect your opponent to get so much of a flop, which is exactly just happened as Fred Paradis looked poised to claim this Card Player Poker Tour Main Event title until the river saved Dilipkumar Patel. The action was picked up on a flop of [7h][5d][10h] with Paradis check-raising Dilipkumar's continuation bet. Patel would then announce himself "all-in" and Paradis would snap call and turn over [10c][5s] for top and bottom pair. Patel would table [Ad][As] and would need to hit to save his tournament life. The turn would bring the [Kc] and Patel would either need the board to pair, other than a ten or a five of course, or an ace on the river and he'd get the latter as the [Ah] spiked to prolong this heads up battle. Patel needed that double up more than anything as he was extremely short stacked compared to Fred Paradis and while he most likely had visions of getting a full double when he looked down at his rockets, he didn't think he'd have to spike a set on the river to do so. Patel's rail would laugh as they've been calling him nicknames all day and they'd make it clear that they would only be referring to him as "mystic river" from now on as he's somehow still alive for this CPPT Main Event title. Our two remaining players are basically now back to where they started this heads up battle, dead even in chips. First, these two players have realized that this payout structure is somewhat steep, so they've agreed to a chop of the prize pool, with each player locking up $70,000, leaving just over $11,500 and the trophy to be played for. Second, these two players were almost dead even in chips, with Fred Paradis holding a slight advantage when heads up play started, but in the first few hands he's taken complete control and now sits with a 6,600,000 to 1,700,000 chip advantage. Third, this isn't just any Foxwoods Poker trophy we are playing for, as we introduce the CPPT Foxwoods Main Event Cup, easily the coolest trophy we have ever seen awarded in a poker tournament. As we are making this post, the players are about to go on a much needed 15 minute break and we will pick up the action as soon as they restart play. 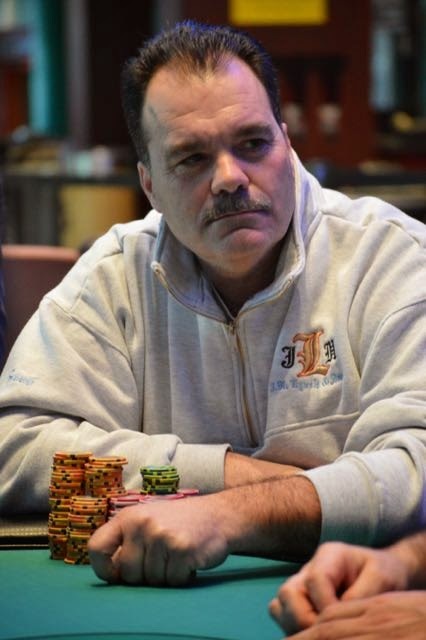 PJ Caruso came off to a fast start after the dinner break, knocking out Frank Sgambato and Jay Feingold in 4th and 5th place respectfully, but after play got to three handed it didn't go as smoothly as he was time and time again cut down by Fred Paradis and eventually was the shortest stack at this Card Player Poker Tour Main Event Final Table. He'd eventually get his final 1,700,000 chips in the middle after Dilipkumar Patel opened the action from the button to 500,000 a massive over raise, basically committing himself to the pot after Caruso shoved. Patel would mumble something about "knowing he was going to do it" and snap called with [5c][5d]. Caruso was racing for his tournament life holding [Ad][Jh] and would be unable to find a pair on the [6s][3d][2s][3c][9c] run out, eliminating him in 3rd place. Caruso was one of the more aggressive players throughout the last two days of this event and it looked like he had taken control after the dinner break, but he was unable to continue that momentum and would make the biggest cash of his career, $38,000 for his podium finish. We are now heads up for the CPPT Main Event title with Fred Paradis and Dilipkumar Patel somewhat evenly stacked with an updated count coming shortly. There's a moment in every game, every event, every competition where a player just takes over. Think Tom Brady in the 4th quarter, David Ortiz at bat with the game winning run on second base, they know they're going to deliver, you know they're going to deliver, heck the other team knows it. 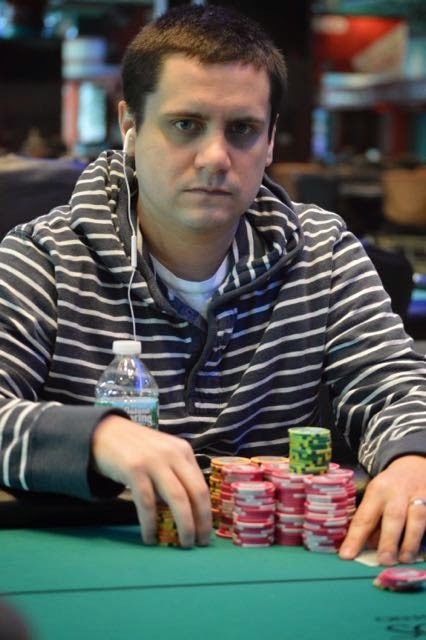 PJ Caruso and Dilipkumar Patel are starting to get the picture that Fred Paradis is taking over this Final Table and there might not be anything they can do about it. Our three remaining players all just saw a flop of [9s][8h][9d] and Patel and Paradis would check to the pre-flop aggressor and Caruso would fire out a continuation bet of 250,000. Patel would fold and Paradis would then check-raise to 650,000 and force a fold from Caruso after close to two minutes in the tank. Paradis would smile and throw over [3h][5h] and if you didn't know about Fred Paradis before that hand, now you know as he seems to be playing on a completely different planet than these other two and is showing no signs of slowing down as he's approaching the 4,700,000 chip mark with the majority of his chips coming from PJ Caruso over the last level or so. We've just moved into Level 30 of this Card Player Poker Tour Main Event and we are still three handed at this Final Table. With the blinds and antes going up again each orbit will "cost" the players 150,000 chips, which is not a small "price" to pay to see three hands and that should force the action here. Not that these three need any incentive as they've been leveling each other for the last half hour, with Fred Paradis and Dilipkumar Patel getting into what we have to chalk up to a ego war as both players seem to want to play every pot and have been clicking it back at each other almost non-stop. 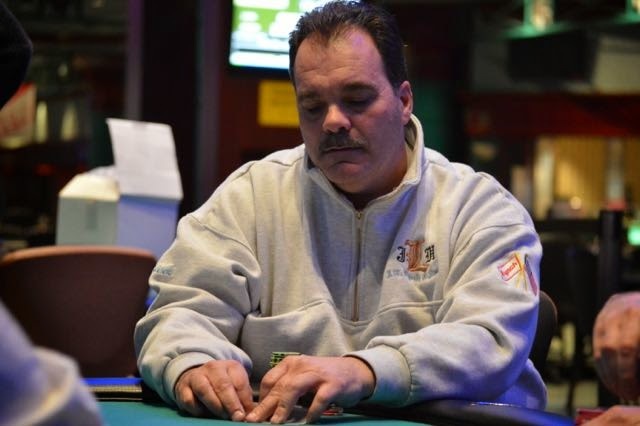 After ending Day 2 on a tear being the first player up and over the 1,000,000 chip mark, Fred Paradis has had a much different day here at the Card Player Main Event Final Table he has yet to play a really big "decisive" pot. That doesn't mean that he hasn't been active, quiet the contrary actually, as he's been involved in the majority of the "smaller" pots, taking most of them down to remain above the chip average, allowing him to keep up with the chip leaders. His plan has worked to perfection, as he's played this Final Table on his terms and is now three handed for the CPPT Main Event title and with the chip lead after using PJ Caruso as a whipping boy over the last few orbits. First Paradis bluff shoved his stack to take a massive three-bet pot away from Caruso and then he's taken the last two pots off of Caruso, letting his opponent do most of the betting, calling down with better holding each time for small improvements to his stack. 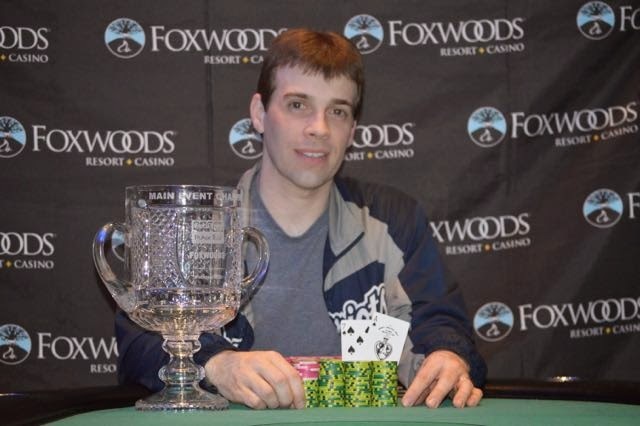 These "body shots" might not be the knockout blows that we've seen at this Final Table, but for a four time defending Foxwoods Champion in his own ring, it might just be a matter of time before he lifts this CPPT Main Event Cup and solidify himself as one of the best Foxwoods players ever. Paradis now sits with just under 3,500,000 holding a slight advantage on his two opponents. There are also just under 10 minutes remaining in Level 29, with the blinds and antes set to go to 40,000/80,000/10,000 at the next level up. Frank Sgambato returned from dinner as the shortest stack at this Final Table and he was certainly comfortable in that role, as it was one that he's held for the last few hours. 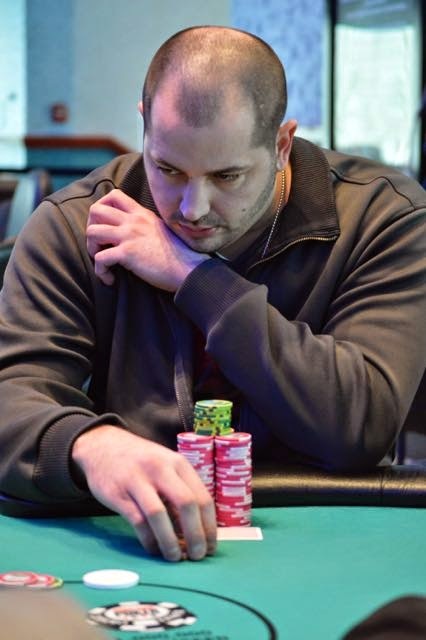 He's made all-in moves numerous times, doubling up on a few occasions but for the most part he's yet to be looked up and after the elimination of Jay Feingold in 5th place, he'd make another all-in move and this time would get looked up, again, by PJ Caruso. Caruso would have Frank dominated [Ah][Qs] to Frank's [Ks][Qc] and he'd have the hand locked up on the turn as the board ran out [6c][7s][9d][Ad][Qh]. Frank had held on with a short stack for the better part of today and while we aren't going to make any assumptions, as it was a standard play from his position with his chip stack, but the tension of the moment seemed to be lifted as soon as we made that pay jump to forth place as everyone at the Final Table was guaranteed at least $30,000. That's what Sgambato would take home for his efforts, more than tripling his previous career live earnings mark in the process. The final three players are all pretty deeply stacked and very closely stacked as Fred Paradis just bluff shoved his stack to take a decent pot off of PJ Caruso to bring himself up to their standing. Each player is on either side of the chip average as we have an "level playing field" as we continue to play down to a CPPT Main Event Champion. We barely had a second to put up our "back from dinner" post before we lost two players in back-to-back hands, with both players getting sent to the rail by PJ Caruso. The first player out would be Jay Feingold and the action was picked up on the flop of [9d][10c][7c] with Feingold check-raising all-in after Caruso fired out a continuation bet of 200,000. Feingold's all-in amount was for just over 600,000 more and Caruso would take a second to think before shaking his head up and down and saying "call". Caruso would table [Kh][10h] and Feingold would be drawing thin as he held [10d][5d]. The turn would bring a very interesting [Kd] giving Caruso top two pair but also giving Feingold a flush draw. He'd have nine diamonds that could save his tournament life but none of them would come on the river as it brought the [7h] and an end to Feingold's deep Card Player Poker Tour Main Event run. Feingold flew almost completely under the radar for the majority of yesterday and bagged up one of the bigger stacks as he ran a heater through the later portions of Day 2. He kept that up but like someone on the rail said, after having his pocket queens cracked by David Grandieri's [2s][3s] just nothing seemed to go right and he'd eventually be the next player eliminated making just over $22,000. The five remaining players have returned from their dinner break and are seated and ready to restart play here in the Card Player Poker Tour Main Event. The remaining players are fighting for a better part of a $410,000 prize pool and the next few pay jumps should dictate play a little bit as two short stacks are left at the Final Table and those two spots are extremely valuable in terms of dollars. The Foxwoods Poker blog will bring you all the action from this CPPT Main Event Final Table until we crown a champion and you can watch the action on the CPPT live stream at CardPlayer.com. We just played through a very groggy last 30 minutes to Level 28, with not much of anything notable or reportable happening. The players will return from dinner at 8:10 PM and here are the remaining players with their chip counts at this Card Player Poker Tour Main Event Final Table. PJ Caruso has had a roller coaster of a day, but enters the dinner break on an upswing after getting a massive double up with pocket aces. He's currently the chip leader with 2,795,000. 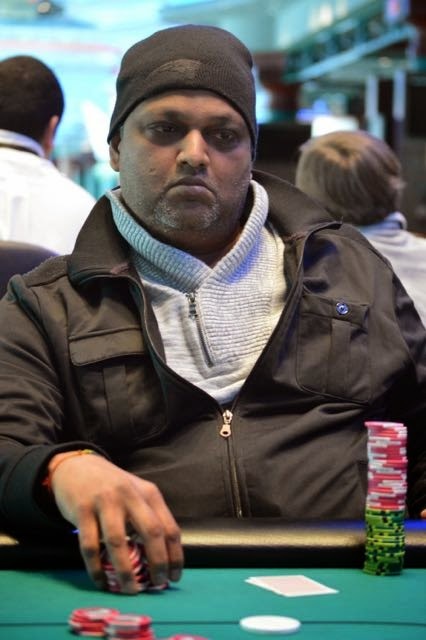 Dilipkumar Patel enters the dinner break with the second biggest stack, playing 2,705,000 but it hasn't been easy for him as he's seated between the two biggest and most aggressive stacks at the table. 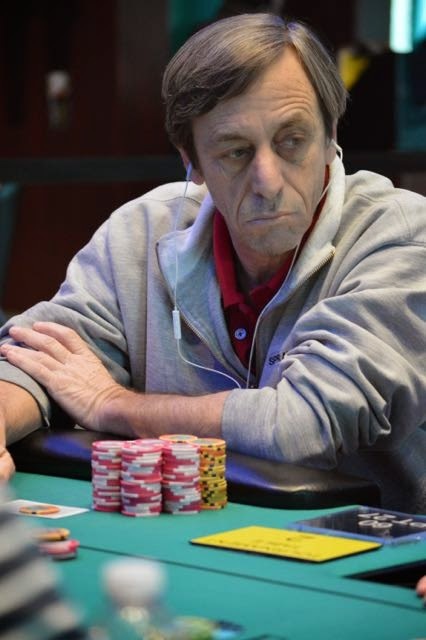 Fred Paradis has quietly hovered near the chip average for most of this Final Table, picking up the majority of the "smaller" pots to keep himself ahead of the blinds and antes. He'll return to a stack of 1,475,000. 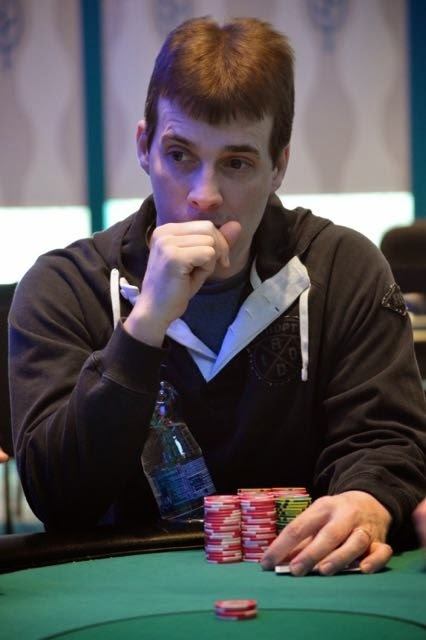 The red hot heater that Jay Feingold started this Final Table with has certainly cooled off as he's still stuck under the 1,000,000 chip mark after a tough last two levels. 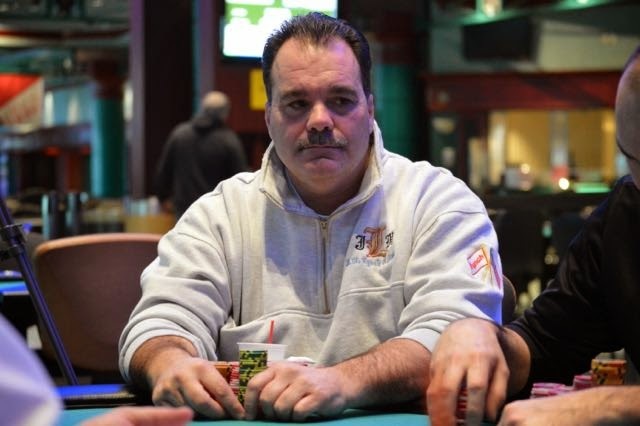 Frank Sgambato is the shortest stack at this Final Table as he'll return with just 10 big blinds, but he wants his friends and family following along to know that "he's alright and that he's going to turn this around after dinner". Jay Feingold didn't show much emotion after his pocket queens were cracked by David Grandieri earlier in Level 27 and he didn't show much emotion when his pocket queens held up against Grandieri in a blind versus blind encounter that saw Grandieri open shove from the small blind and Feingold snap in the big blind. Grandieri has time after time been run over by Feingold at this Final Table and this would be the last time as his [Ac][8s] could not find enough to double him up as the board ran out [3d][8h][6s][4h][2c]. The table joked slightly that Grandieri's deuce/three from last hand would have been good again but there wasn't much laughing from Grandieri's corner as he just couldn't avoid running into Feingold's "it" here in the Card Player Poker Tour Main Event. Grandieri was one of the more memorable players from this CPPT Main Event as he made what we can honestly say was one of the better calls we've ever seen on Day 2 and played nearly flawlessly for the later portions of that day and the first few levels of today. He just couldn't get much traction at this Final Table though and would be eliminated in 6th place, earning just over $18,000 for his deep run. There are just over 35 minutes remaining in Level 28, with Frank Sgambato working with just over a 10 big blind stack and he is now the new "player to watch" as he'll need to double up to get back into this Main Event. While we haven't reported any of the hands they've played, as we were kind of waiting for the "big one", PJ Caruso and Dilipkumar Patel have exchanged blows both on and off the felt, with each player having a "sense of humor" that clearly plays off of one another. There's been some tension but it's been mostly just playful batter until now as that tension has boiled over after a recent "big" hand in which Caruso doubled up through Patel [Ad][Ac] versus Patel's [Jd][Jh]. Caruso would open the action and Patel would three-bet to 400,000. The table would fold and Caruso would four-bet leaving himself just 250,000 chips behind. Patel would take a minute to think about his decision and then announce "all-in" with Caruso snap calling tabling his "blades". Patel would need to catch two outs to score the knockout as he had Caruso well covered and he'd pick up more outs as he flopped a gut shot straight draw but would brick out on the turn and river doubling up Caruso. Caruso would double up to just over the 1,650,000 mark with Patel playing just about the same chip stack. The blinds and antes went up prior to this hand and we are just under an hour until the dinner break. 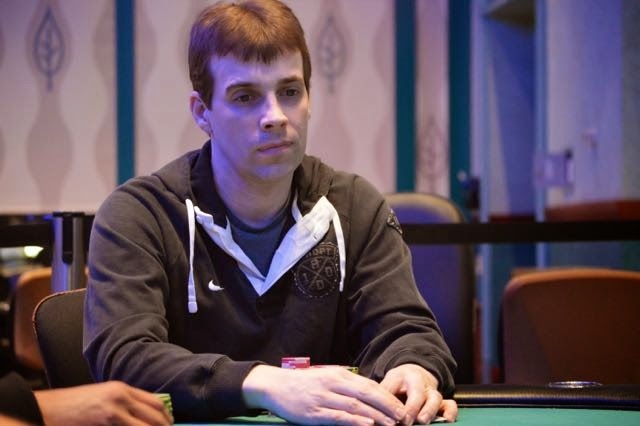 The tide and momentum of this Card Player Poker Tour has shifted drastically over the last half hour, with the majority of Jay Feingold's stack being redistributed around the table. Players will play one more level after Level 27 after which they'll be given an hour long dinner break that should start around 7:10 PM. The Guy Who's Always Had "It" Seems To Have Lost "It"
Jay Feingold has run like god for the last few levels and in poker, you always seem to regress back to the mean and after flying high and controlling the chip lead for the last few hours, he's now back down below the chip average for the first time in recent memory after taking a horrible beat against David Grandieri and then doubling up Frank Sgambato in back-to-back hands. The first hand saw Grandieri open shove close to 500,000 chips from the cut off and Feingold would call on the button to put Grandieri at risk. Grandieri would flash his cards to Fred Paradis who had to hold back some laughter with Grandieri tabling [3s][2s] and standing from the table to say, "It a joke anyway." as Feingold threw over [Qh][Qc]. Grandieri was almost out of the tournament area as the [7h][9s][5d] flop came down and then cut his exit short when the [3h] fell on the turn. He'd be heading back to his seat as the [2d] spiked on the river giving him an unlikely double up with an even more unlikely two pair. Feingold couldn't believe it and neither could anyone else at the table, but after getting cut down to just over the 1,600,000 mark, Feingold would be sending more of his chips to his opponents as he and Frank Sgambato got tangled in a three-bet pre-flop pot with Feingold leading out on a board of [6c][3s][2c] only to see Sgambato move all-in for just under 150,000 more chips. Feingold had to call as there was already close to 900,000 chips in the pot and he would looking to catch an ace tabling [As][10h] with Sgambato turning over [Kh][Kc]. The board would run out with two more clubs and Sgambato would end the hand with a flush and complete a hugely important double up while Feingold is now left with just over 1,000,000 chips and will have to regain his composure and his run good to get himself back into this Card Player Poker Tour Main Event. 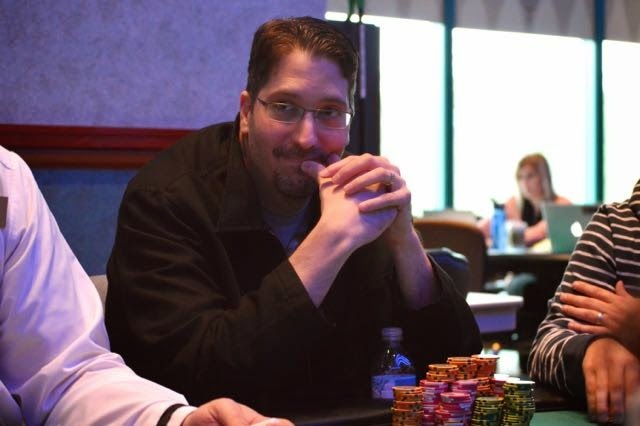 "What A Tough Spot Against The Guy That Always Has It"
After coming a back from break with one of the shorter stacks at this Card Player Poker Tour Main Event Final Table, David Grandieri has lost a decent percentage of his stack through the first few hands of Level 27 as he's opened the action with a pre-flop raise twice and both times Jay Feingold, who is to Grandieri's immediate left, has three-bet to take down the pot. After the second time Grandieri would say, "What a tough spot against the guy that always has it." before pushing his cards into the muck. Feingold would have "it" that time, showing [Qh][Qs], getting on the table from Grandieri. While Grandieri has lost close to 20% of his stack to open up the action here in Level 27, he's been short stacked before as he came into yesterday's Day 2 session with 20,000 chips or 9 big blinds and was able to spin that up to a workable stack before taking control of the chip lead in the middle of the day. The man who the twitter world calls "Silent Storm" will have to wait for a better spot, or until Jay Feingold cools down as he has had some monster hands today, to chip up as he's now playing just over 12 big blinds. 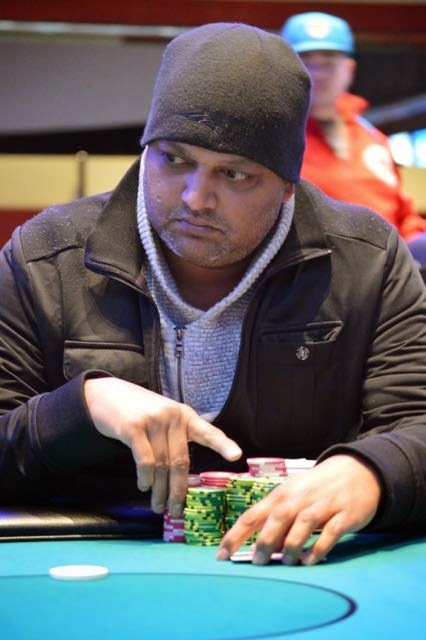 After the elimination of Sharman Olshan in 7th place we saw a few decent sized pots develop that chipped up both Dilipkumar Patel and Fred Paradis, but for the most part it's been an extremely quiet last hour or so. That's not surprising though as mostly all of the remaining players are "deep stacked" with no one stuck playing a sub 10 big blind stack or anywhere near the "danger zone". Tournaments usually run in peaks and valleys and we saw that yesterday when we were on the bubble for close to two hours and then saw over a dozen players get eliminated in the next two levels. The same "stop and go" pace has happened today as we got down to our "unofficial" Final Table in under an hour and have hit a bit of a pause in the action as these players know what is at stake going forward. Just as we were saying that all eyes were on Sharman Olshan, they literally were as she moved all-in for her final 120,000 from the big blind after Jay Feingold opened the action in late position. Feingold would make the call for just a few more chips and Olshan would be flipping for her tournament life as she turned over [9d][9h] against Feingold's [Qc][10s]. Feingold would flop a pair and a redraw to a straight on the [Ad][Kh][Qc] board and the turn and river would have to bring a nine to save Sharman as they wouldn't with Feingold improving to trips by the time it was all said and done. Despite being hampered by a short stack for the majority of the last few levels, even going back to yesterday, she managed to make some big hands at some big moments and made numerous money jumps to earn the biggest tournament score of her career as she'll make just under $15,000 for her Card Player Poker Tour Main Event run. While Sharman only played in two CPPT events this series, she managed to Final Table both of them, a testament to just how good of a player she is, as there are few, if any other players that can also make that claim. We are now six handed with just twenty minutes until our next break. We don't want to say that all eyes are on Sharman Olshan, but they are as the only remaining female player at this Final Table is down to her final few big blinds and with some pretty decent pay jumps coming over the next few eliminations, it's no surprise we've seen play more or less come to a halt here as the rest of the field just waits for Sharman to be eliminated. We're not saying that's guaranteed to happen either, as Sharman was in a similar situation on yesterday's money bubble and has worked a slightly below average stack to this point, so one double up could get her started on a pretty spectacular Final Table comeback. One of the weirder hands you'll see not just at a Final Table, but at any poker table, just occurred with Sharman Olshan and David Grandieri both having the same exact holdings and PJ Caruso covered with Olshan and Caruso all-in pre-flop with Caruso surviving the all-in to triple up. The action was picked up with Caruso opening to 90,000, committing close to 30% of his stack, in early position. Olshan was to his direct left and would three-bet to 200,000. The table then folded to Grandieri who would announced himself "all-in" on the button, having both players well covered. Caruso sat on his hand for a while, standing up from the table and wondering if he could get away from the hand after opening for a decent portion of his stack. He couldn't as he'd call to put himself at risk with Olshan following in behind him, also putting herself at risk. The hands were then tabled and Grandieri and Olshan each had variants of pocket queens, with Caruso treading water needing to catch to stay alive holding [Kc][Jd]. He'd lock up a triple up as the flop came down [4d][Ks][3c] and Grandieri and Olshan would be drawing dead and be chopping up the side pot, more or less getting their original stacks back minus the 280,000 total of Caruso's starting stack. After the hand Caruso would be sitting at just under 1,000,000, a massive swing that has again changed the dynamic of this table as Olshan is now sitting with just over 250,000 and is the shortest player at this table with 10 big blinds. Players are also just a few minutes from Level 26, meaning that those "short" stacks are only going to get shorter as the big blind will not "cost" players 30,000 chips. 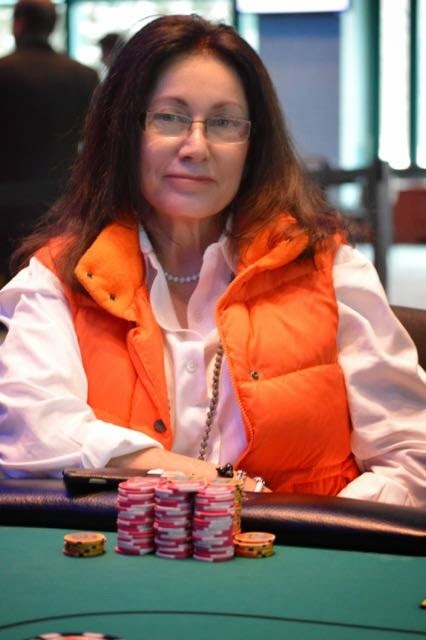 It's been a pretty "uneventful" first half to Level 25 with only one "major" hand playing out when Sharman Olshan doubled up through the chip leader Jay Feingold with her [Ac][10s] winning a race against Feingold's [5h][5c]. The shove would only be for a few big blinds and Feingold has gotten those chips back and more as he just eliminated David Stefanski in 8th place, as he was unable to completely recover from his tough beat against Frank Sgambota. The action was picked up with Feingold limping in the cut off, a play he's done a lot at this Final Table. Stefanski would then move all-in from the button for just under 325,000 and both blind would call and Feingold would snap call, tabling [Ah][As]. Stefanski has "punished" the Feingold's limp a few times today, but this time he'd be the one getting punished as he tabled [Kc][8c] and needed a lot of help to survive. He'd get a best case scenario flop of [Qc][7c][5d] and he'd use his "one time" as the turn bricked out with the [7h] and his call wouldn't be answered as the [9d] missed his flush and Stefanski would be getting sent to the rail in 8th place. 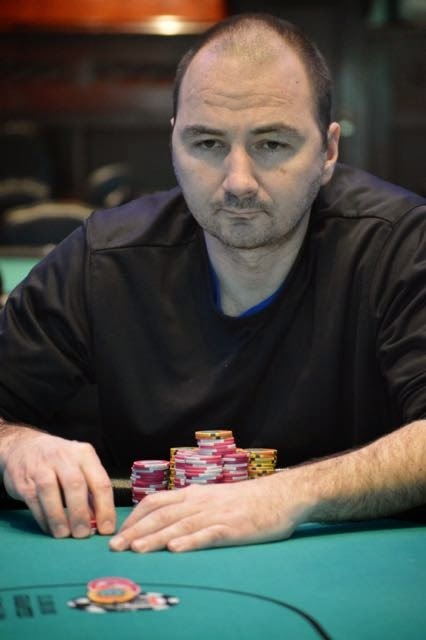 This was Stefanski's first tournament appearance of 2015 after he and his wife gave birth to their first daughter in early January and it wasn't a bad comeback effort for the successful tournament pro, as he'd earn just under $12,000 for his Card Player Poker Tour Main Event Final Table run adding another deep Foxwoods run to an already spectacular tournament resume. Jay Feingold now controls close a quarter of the 8,500,000 chips in play and as we were posting this elimination hand, PJ Caruso was losing a majority of his stack to Dilipkumar Patel, making him the new short stack at this Final Table. Yesterday, while the Card Player Poker Tour Main Event Final Table was playing down to their champion, the Event 12 field was also playing down to a champion as well ending with Daniel Marino claiming the trophy and the top prize of $12,027 after a three-handed deal was reached between he, Ed O'Connell and Jimmy Nunes. O'Connell and Nunes would each take home $10,000 even. We're now on a quick 15 minute break and the players will return to Level 25. There was some chip movement since the last "big" hand with David Stefanski and Frank Sgambato but the majority of the stacks have remained somewhat the same and the players at this Final Table, other than Sharman Olshan and Stefanski, are all within "touching distance" and one more hand could again swing the momentum of this Final Table. Frank Sgambato has avoided elimination twice today and now sits with the biggest stack at the Final Table after turning a straight against David Stefanski. Big pots are playing out every few hands at this Card Player Poker Tour Main Event Final Table and while this one didn't end with an elimination, it's certainly changed the dynamic as David Stefanski has now been cut down to below the chip average with Frank Sgambato now sitting with what looks to be the chip lead. The action was picked up on a flop of [Qc][Jh][9d] with Stefanski checking to Sgambato, who would fire out a bet of 125,000. 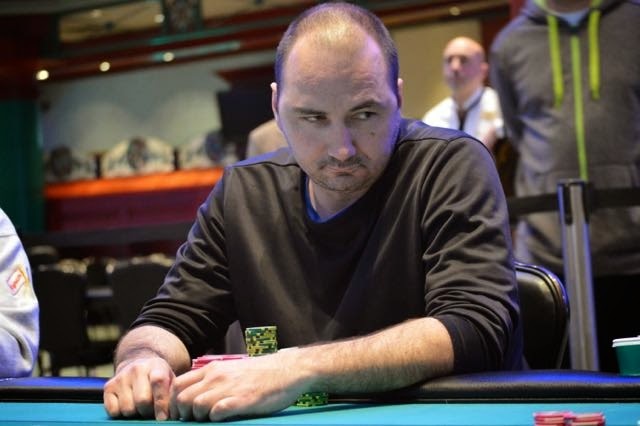 Stefanski would then check-raise to 330,000, with Sgambato quickly pushing his remaining 660,000 chips across the line, putting himself all-in. Before Sgambato could even get to the betting line Stefanski would announce "call" and table [9c][9s] for a perfectly disguised flopped bottom set. Sgambato would grimace and table [Kc][Ks] and his over pair looked like it was about to be cracked as he needed to hit on the turn and river. Sgambato would not only have two kings left in the deck to hit, but he'd also have a gut shot straight draw and that's the card he'd bink as the [10s] came on the turn. Stefanski was now the one looking to hit as he would need the board to pair on the river to save himself from losing a massive percentage of his stack. It wouldn't as the [4h] would brick out and Stefanski would be sending close to half of his stack to the left as Sgambato turned a winning straight after being way behind on the turn. Sgambato has come back from dire all-in confrontations twice today, the first in which he cracked Jason Calnan's pocket aces at the start of the day and now suddenly sits with close to 1,400,000 making him the biggest stack at this Final Table. 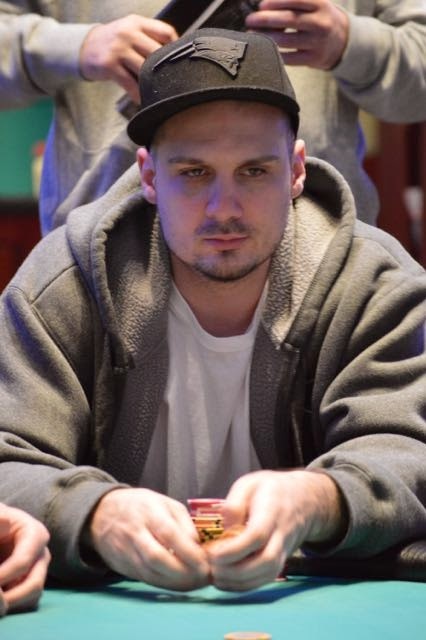 Just a few hands after the restart one of the bigger pots of the tournament just played out and it would end with our first elimination from this "official" Card Player Poker Tour Main Event as Bobby Corcione (Bellingham, MA) has been sent to the rail in 9th place. The action was picked up pre-flop with PJ Caruso opening to 75,000. Fred Paradis would then three-bet to 220,000 from the button and Corcione would then move all-in for less from the big blind. Caruso would take close to a minute and a half to make up his mind, eventually calling to send three players to the flop. While Caruso took his time make his decisions pre-flop, he wasted no time announcing himself "all-in" after the flop of [6c][9d][Qd], immediately making his verbal declaration. Paradis sat in the tank for a minute and then shook his head before folding. The card were tabled and Caruso held [4c][4h] for the current best hand, with Corcione needing to his one of his two overs as he held [As][Kd]. That wouldn't happen as the turn bricked out and the [4d] came on the river, locking up the pot and eliminating Corcione. Paradis said he also held big slick, something Corcione certainly didn't like to hear as he was drawing to less outs than he thought and if Caruso hadn't called the bet after a three-bet and all-in shove, he'd have chopped the pot and still be alive in this CPPT Main Event. Instead, he's the first player out of this "official" Final Table making just over $9,000 for his deep Main Event run. Caruso is now suddenly one of the chip leaders at this Final Table, currently playing 1,200,000. After the elimination of Paul Freedman in 10th place, we are now down set at our "official" Card Player Poker Tour Main Event Final Table. The players are now on a 15 minute break as we collect chip counts and the CardPlayer live updates team puts the finishing touches on their "live stream" which will be viewable at CardPlayer.com. There will be just under 50 minutes remaining in Level 24 when play resumes in a few minutes. 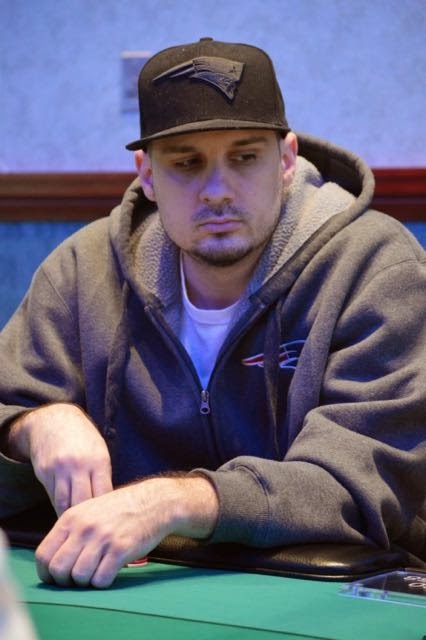 We are officially down to our "official" Card Player Poker Tour Main Event Final Table as Paul Freedman (Seabrook, NH) has just been sent to the rail in 10th place. The action was picked up with David Stefanski raising from late position to 42,000 and PJ Caruso would call on the button. 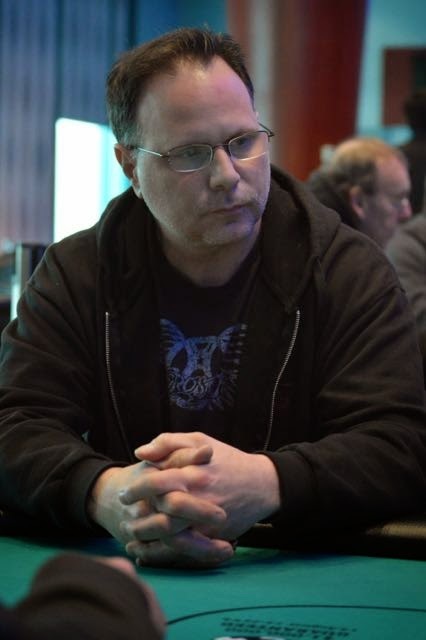 Freedman would then move all-in for his final 155,000 and Stefanski would call, forcing a fold from Caruso. The two players would table their hands and Freedman would be flipping, but it wouldn't be the flip you'd expect, as he held [3d][3h] and Stefanski held [4s][5s]. The board would run out clean for Freedman and he seemed destined for a double up until the [5c] spiked on the river, giving Stefanski a pair of fives to score the knockout. In the next post we will bring you all the information so you can follow the CPPT Main Event "official" Final Table. 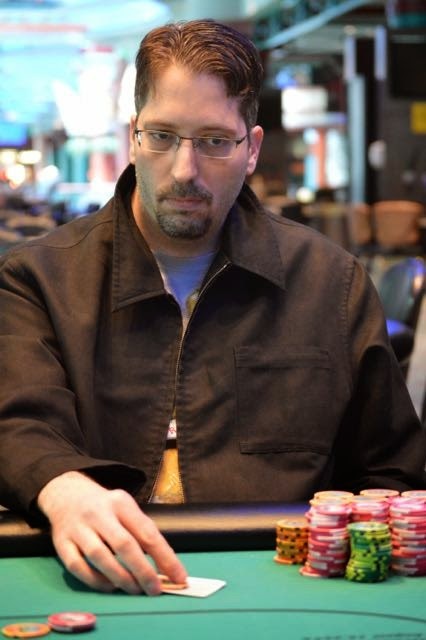 Jay Feingold sat with a well below average stack for much of yesterday's Day 2 session but peaked in the last level of the night and has continued to chip up here heading towards the "official" CPPT Main Event Final Table. 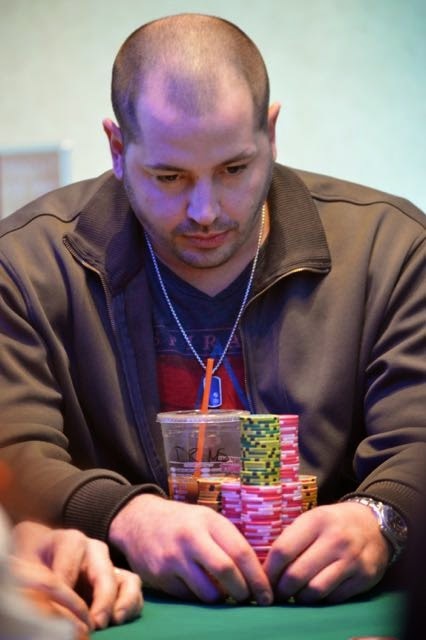 During yesterday's Day 2 coverage, nearly every player at this Card Player Main Event Final Table was referenced in one way or another, whether it be in a "Face In The Crowd" post or in a hand history, but one player who completely flew under the radar was Jay Feingold (Long Island, NY) who was sitting with a well below average stack for the majority of the day but then peaked in the final level of the night to bag one of the bigger stacks returning to Day 3. Feingold said he was dealt pocket Kings about four times over the last hour and while he probably haven't been getting monsters like that so far today, he's continued to chip up and is now peaking at 1,300,000 sitting atop the CPPT Main Event Final Table. 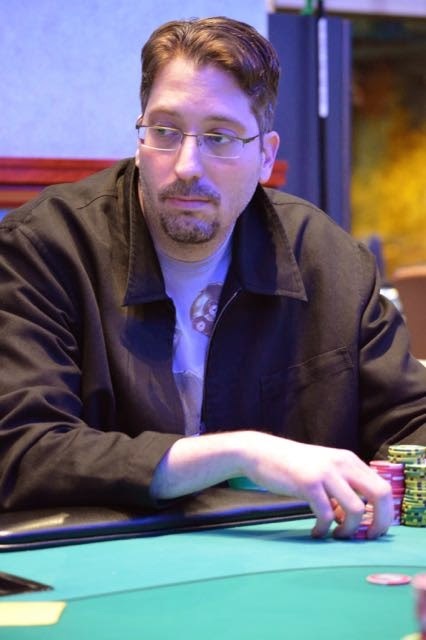 Feingold might not have the best tournament resume at our Final Table, but he's made a handful of Final Tables in his career and has one major tournament victory to his name as he won a Mohegan Sun Summer Showdown event last summer for $10,000, his biggest tournament score to date. He's more or less guaranteed himself a bigger score here as he's making his first ever championship cash here in the CPPT Main Event as we are still ten handed looking to get to our "official" Final Table. We are now ten handed in the Card Player Poker Tour Main Event and the players have redrawn for their "unofficial" Final Table seats, as the CPPT doesn't consider it "official" until we are nine handed. After the next elimination there will be a break in the action as the CardPlayer live updates and production sets up their live stream, which will go live once we are nine handed. 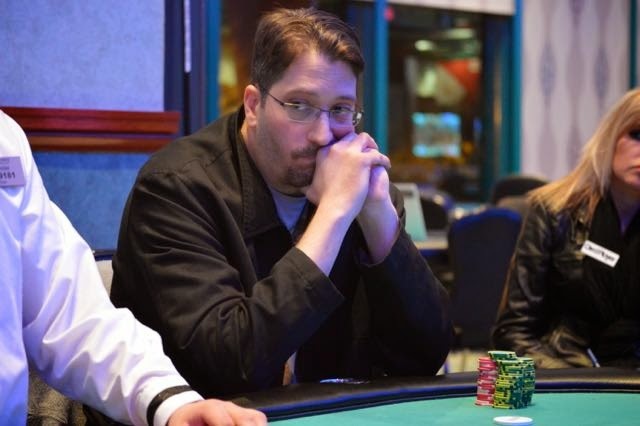 After getting crippled by Frank Sgambato, Justin Calnan was left with just under 100,000 chips and although he managed to get a double up through Dilipkumar Patel to get back to a "workable" stack, Sgambato would be finishing the job a few hands later. The action was picked up with Calnan open shoving from middle position and David Grandieri would call on the button and Sgambato would flat in the small blind as well. Sgambato would then open shove close to 315,000 on a flop of [4s][Qh][4d] and Grandieri would toss a chip onto his cards and push himself away from the table. Sgambato would count out his chips and Grandieri would say, "It's irrelevant." rolling his eyes as he clearly had a big decision on his hands. He'd eventually fold [As][Qc] face up, a massive lay down of top pair, top kicker, but it would turn out to be the right one as Sgambato turned over [Kh][Ks]. Calnan would need to hit on the turn and river as he held [8h][8c] and Sgambato's pocket Kings would hold to finish Calnan off in 11th place. Prior to that elimination, Michael Borchetta who came into today as the shortest stack couldn't have his [Ad][Kh] hold against the [Kd][9d] of Dilipkumar Patel's [Kd][9d] on a board of [3d][Qh][4d][3c][9s]. Both Calnan and Borchetta will make $6,564 for their efforts. We are now down to our "unofficial" Card Player Main Event Final Table, as there are ten players remaining and the players are now redrawing for their Final Table seating assignments. After the first elimination at this Final Table there will be a short break for players to fill out their informational sheets for the CardPlayer.com live stream broadcast. If you thought the start of this Card Player Main Event final day was going to start slowly or follow the pace of yesterday's money bubble, you were dead wrong as there have already been two eliminations and one player who came in with a big stack but is now crippled as these final two tables have come out firing. 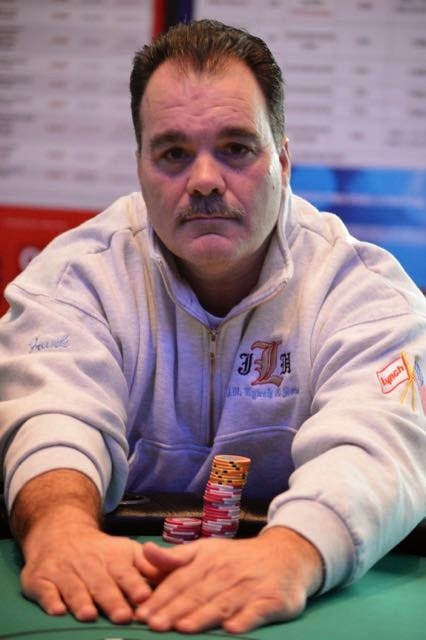 On one of the first hands of the day, Stanley Lee was being sent to the rail after opening in early position with David Grandieiri calling in late position. Lee would then check-raise shove a flop of [7d][6s][4d] and Grandieri would call, tabling [6h][Ah] with Lee looking for another diamond as he held [Ad][9d]. The board would run out with the [7c] and [6c] ending Lee's CPPT Main Event Day 3 after just a few minutes. 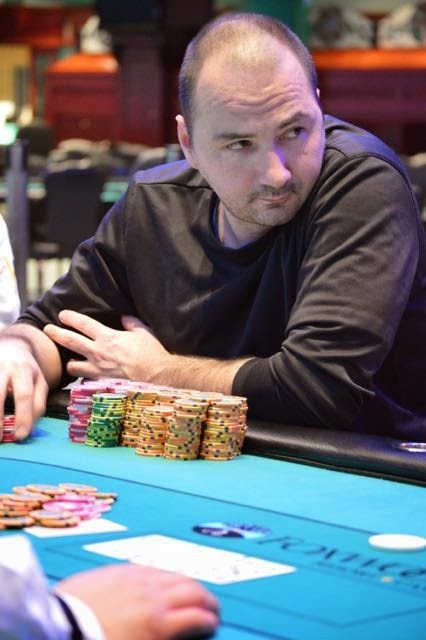 Almost immediately following Lee's exit, Dan Chalifour was being sent to the rail as well, with the short stack moving all-in from the button with [Qc][8c] and Dave Stefanski calling with [Kd][9d] in the blinds. Stefanski would turn a pair to eliminate Chalifour, as he and Lee would both make just over $5,500. The action wouldn't stop there though, as Jason Calnan would open from middle position to 36,000. Grandieri would then flat call on the button and short stacked Frank Sgambato would move all-in from the small blind for 193,000. Calnan would immediately announce himself all-in and Grandieri would quickly get out of the way as Sgambato's attempted "squeeze" play would look to be his last as he tabled [Qd][Jc] and Calnan turned over [Ac][As]. Sgambato basically had one foot out the door until the [Qc][Qs][Kd] flop that gave him renewed tournament life and sent Calnan into a daze as he couldn't believe is lack of luck. Calnan would be crippled to just under 100,00 chips while Sgambato is now up to close to 450,000. The remaining players have taken their seats at the final two tables as they return to play down to a Card Player Poker Tour Main Event Final Table and Champion. Due to another storm in the New England area, the Event 13 Bounty tournament scheduled to start at 11 AM has been cancelled, but that doesn't mean that there won't be tons of action in the Foxwoods Poker Room today, as the Card Player Poker Tour Main Event will return for it's final day, as well as the Event 12 restart, with both events playing to a champion before day's end. The focus of the Foxwoods Poker blog, as it has been over the last few days, will remain on the CPPT Main Event, with 14 players returning to play down to a Final Table, that will be live streamed on CardPlayer.com. The Main Event and Event 12 will all resume play at 12 PM and the remaining players, along with their chip counts and new seating assignments have been posted below. The Foxwoods blog will be picking up all the action just before play resumes at noon. 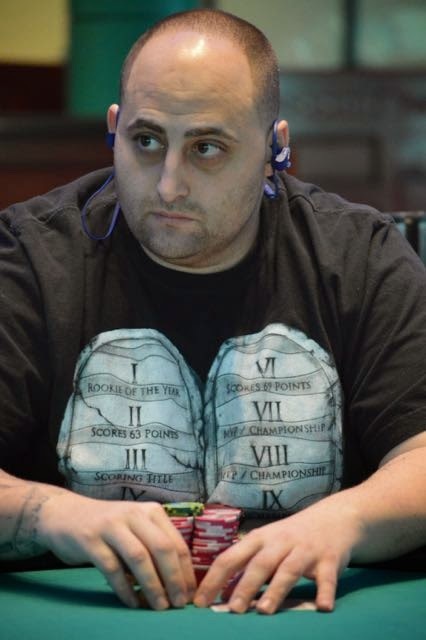 The final five hands played out with this Card Player Poker Tour Main Event losing Ryan Mostafa on one of the last hands of the night as his nightmare Level 22 saw him exit in 15th place. The remaining 14 players have bagged up their chips and will return tomorrow at 12 PM to play down to a CPPT Main Event Champion. The Foxwoods blog will be back for the 12 PM restart and will bring you all the action as we play down to a CPPT Main Event Final Table and Champion tomorrow. A few minutes ago, Ryan Mostafa held one of the bigger stacks in this Card Player Poker Tour Main Event field, but after back-to-back hands which can only be described as a "disaster" he's now the shortest stack in the field with just five hands remaining in Day 2. 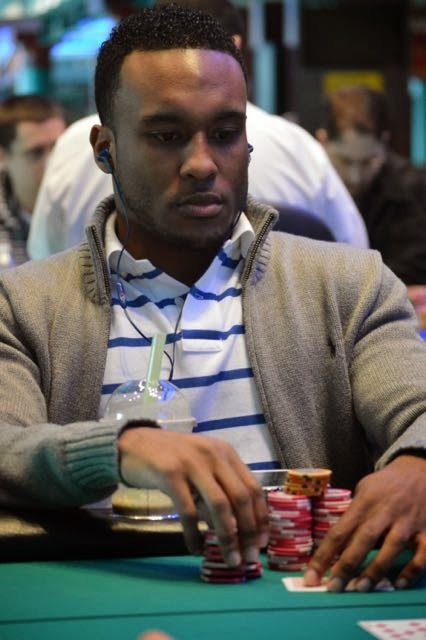 The first hand saw Sharman Olshan move all-in from early position and Mostafa would call and be an 80% favorite to score the knockout and move himself up and over the 1,000,000 chip mark as he held [Ad][Ah] to Sharman's [Qd][Qc]. Sharman would stand from the table after the [10d][Jd][6c] flop, but the [Qs] would save her tournament life on the turn and she'd hold through the river to complete the double. Mostafa couldn't believe it and one the very next hand he'd be left dumbfounded again as he opened from middle position and would call the all-in shove of Bobby Corcione, holding [10c][10d] to Corcione's [Qh][Qd]. The pocket Queens would win again and after being on the verge of ending this Day 2 session with over one million chips, Mostafa is now looking to bag anything he can as he's well under a 10 big blind stack. Sharman and Corcione on the other hand are both on either side of the average, with Sharman playing 400,000 and Corcione sitting one just under 650,000. We've hit the 10 minute mark in Level 22, meaning we are going to play 5 more hands before the end of Day 2 after which the players will bag and tag their chips for tomorrow's third and final day.